It’s October, so if you hear “Steven Spielberg, Tom Hanks, two hour twenty minute historical drama” and think Oscar bait, you’re not alone. 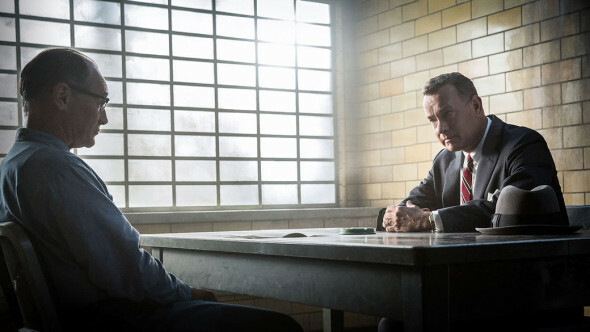 But Bridge of Spies also walks the walk, emerging as a taut, effective and absorbing film, as finely crafted as you would expect from the talents involved. It’s also a wonderful slice of history, especially for those not familiar with the story of Jim Donovan. As the Cold War rages in the late 1950s, Donovan (Hanks) is an insurance lawyer with three kids and a wife (Amy Ryan) in a big house in the New York suburbs. When the CIA nabs Soviet spy Rudolf Abel (Mark Rylance), the head of Donovan’s firm (Alan Alda) volunteers him to help the Feds and give Abel just enough of a defense to make the trial seem legit. Complications arise when the Russians capture one of ours, and a prisoner exchange seems in the best interest of both parties. That’s not the sort of thing governments want to officially participate in, so Donovan is sent to Berlin to negotiate the deal. Standing alone, the true events are undoubtedly compelling, but onscreen they unfold like an intentionally old school genre thriller, crafted by veteran artists wearing their considerable skills like a perfectly broken-in pair of shoes. Spielberg’s sense of pace and framing is casually impeccable, Hanks perfectly embodies Donovan’s inner journey, and Rylance is sure to get Oscar consideration for his scene-stealing perfection. But there’s more. Composer Thomas Newman (what, not John Williams?) provides a gently evocative score, and Matt Charman’s script gets an assist from none other than the Coen Brothers. As the tale moves from courtroom motions to clandestine spy games, it’s punctuated by perfectly realized moments that speak to more universal themes. Schoolchildren frightened by the thought of war, a mad dash to make it over the Berlin Wall, or a pledge to be a justice system that doesn’t “toss people in the trash heap”, all linger just long enough to resonate without manipulation. By the time Donovan heads to the bridge for the prisoner transfer, the only chance of letdown in the film comes from being lulled into complacency by the skill of people who just know what the hell they are doing. You knew Bridge of Spies would be good. It is.